Feral loaned me some photos over Thanksgiving and a few took me right back to the stream. Several years back we were doing the trout closer up by Vanderbilt and we fished a stretch of the Pigeon that requires a lot of walking to reach. After the long trudge in we decided hey, we made it this far, we may as well keep going a few more bends. Ultimately we knew it meant 3 hours of wading upstream to get to our takeout point, and another quarter mile walk through tangles back out to the truck. We went a bend to far, so to speak, and we found ourselves on a gravelly stretch that didn’t look to promising. Feral took the lead. There was a downed spruce angled back towards us, almost completely across the river. Feral moved up so he could run a lure in front of it. 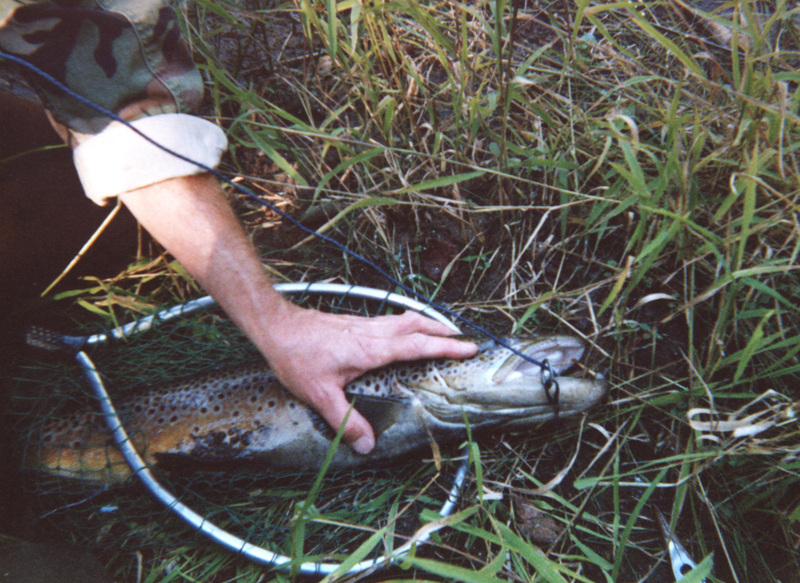 His first cast was slammed by the brown in the above photo. I believe it was twenty seven inches and that meant some soul searching. We don’t usually keep big fish – the small ones taste better. Still, it was a trophy in anyone’s book and we could always grill it, or if he wanted to consider the idea, have it mounted. So Feral decided to keep the fish. 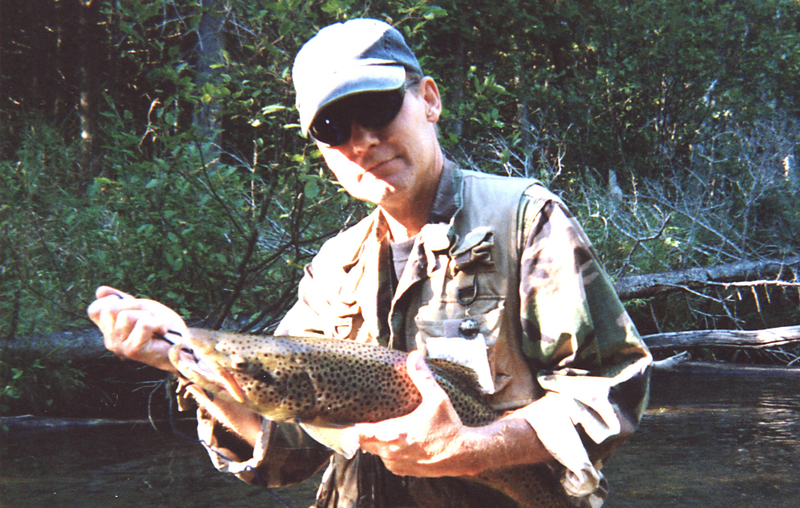 He put it on a stringer and that is where the real soul searching begins because it meant lugging six pound of flopping lively fish while wading upstream through the most treacherous water we fish, over beaver dams, getting out around deep holes, etc. There is a little known formula: The weight of the fish times the speed of the river times distance = the actual weight of the fish, so about thirty five pounds by the time Feral crawled up the bank to head for the truck. There is a second four-mula that comes to mind: Four Motrin + Four Beers. Just the thing for a compressed main spring. As far as I know that fish still resides in his ex-wife’s freezer. Once Feral stops having painful flashbacks of his longest ever trout stretch I expect that trout will grace the wall of his basement. Not over the workbench where he’d have to look at it every day. That would be cruel. In the furnace room next to the water heater. Feral pointed out in his comment he thought the top photo was a brown trout from the Sturgeon River… and he may be right. The above photo is likely the lunker caught on the Pigeon.